It’s the type of week where you don’t want to leave your house, so you start raiding your pantry and seeing what you have to make so you don’t have to leave your house to go to the store. The good news is, this time of year you may already be stocked up on produce and protein. The combinations for stuffed sweet potatoes are endless, but I love the spicy sweetness of this kale, caramelized and chorizo combo. It’s also warm and filling enough to serve as a healthier version of comfort food during these cold nights. 1. In a large frying pan, warm you oil and add the onions. Cook on medium, stirring often until they soften completely and brown. It takes about 20-25 minutes. 2. Add the chopped kale in batches, letting it cook down a bit before adding the next batch. Finally, stir in the chorizo, and let it all cook until warm through. 3. Wash and pierce your sweet potatoes. Cook in the microwave for 4-5 minutes for one potato, or about 15 for all 5, depending on their size and thickness. Once the potatoes can easily be pierced with a knife, slice them open and stuff with the chorizo, kale, and onion mixture. 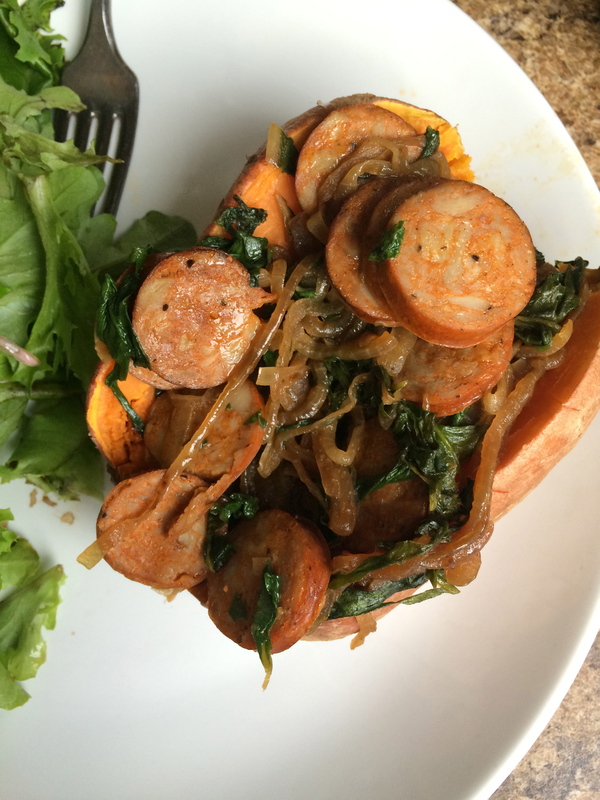 This entry was posted in Uncategorized and tagged caramelized onions, chorizo and kale stuffed potato, Cooking Light, easy dinner, Quick and Easy, Stuffed sweet potato by theculinarycapers. Bookmark the permalink.